I’m a student of Bill McDonough’s “Cradle to Cradle” manifesto on sustainable design. I’m very interested in the difficult challenges of balancing design criteria (such as appearance, performance, and price) and sustainability, as they relate to our choices for materials and processes. Here at Rickshaw, we have a design methodology called “The Power of Zero” — whereby we try to eliminate waste in every aspect of our business, and explore opportunities for closed-loop recycling of environmentally-friendly materials. The messenger bag is such a symbol of cycling culture. What do you love about bags? I love the intense personal connection people have with their own bags. Everyone has a personal story about the bag they’re carrying at any time. I like to say, “every bag tells a story.” I’m particularly interested in the messenger bag category because of its working-class heritage and its adoption as a unisex, everyday, functional fashion accessory. I think the messenger bag can be credited for catalyzing a significant urban fashion movement for men by legitimizing the “man bag”. 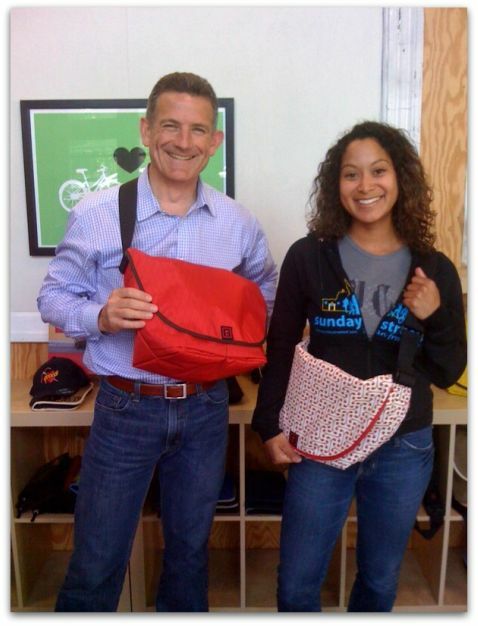 Bicycle messengers are “urban heros”, and the messenger bag is emblematic of the messenger lifestyle. San Francisco is one important epicenter of messenger-inspired, urban bicycling style. I love bags, and I love bicycles. Rickshaw sits right at the intersection of bags and bikes. What things are you passionate about that you channel through Rickshaw? Rickshaw is a wonderful embodiment of several of my personal passions: bags, bikes, business, teaching, and philanthropy. We’re in the business of “making things”, and we’re committed to making things better. We have a guiding principle at Rickshaw, which we express as follows: “We are the only species with the power to change the world — and ourselves. Let’s change for good.” By this, we mean using our unique power as humans to change things for the better. Rickshaw is our laboratory for exploring and experimenting with ways to make a difference — in business and in our community. I’m personally passionate about developing and teaching sustainable design and business practices, eliminating the use of PVC and other toxic materials in consumer and commercial products, and inspiring a new culture of reuse to counteract our existing culture of disposability. What’s Rickshaw’s involvement with the local community? I started Rickshaw as a platform for community engagement. We’re big supporters of the SF Bicycle Coalition, Dave Eggers’ 826 Valencia national youth literacy organization, and At The Crossroads homeless youth outreach program in the Mission. I’m on the board of the SF Chamber of Commerce and the Fort Mason Center, and I’m the founder of SFMade, an association for local manufacturers. We donate bags to numerous local charities, and offer our warehouse free-of-charge for various philanthropic events. We also host factory tours for local student groups, to help inspire our next generation of designers and entrepreneurs. Any new products we should know about? We’ve just launched a refresh of our original computer bag, and a sleeve for the iPad. We have a number of exciting new products in the works for the second half of the year, and some fabulous new fabrics under development. Keep an eye on our web site and Facebook page for announcements. I have a local ride and a long distance ride. Every morning I ride from my apartment in downtown San Francisco, across the Golden Gate Bridge, to Sausalito, where I drink my first cup of coffee and read the newspaper. I watch the sun rise as I cross the spectacular Golden Gate Bridge — it doesn’t get much better than that! For the past two years I have ridden my bicycle from San Francisco to Los Angeles — 500 miles on Highway 1 — to attend the TED conference. They don’t call it the “Great Highway” for nothing. It’s a breathtaking ride along the spectacular California coastline. What’s your involvement with the TED conference? For the past several years, I’ve had the great honor of designing and manufacturing the bags for the TED conferences. We develop a new design specifically for each event. We’re currently making the bags for the upcoming conference in Oxford this summer, and we’re really excited about the surprise we’ll introduce there. I attended my first TED conference in 2005, and it literally changed my life by completely changing the way I think about making things. That’s where I first met Bill McDonough, learned about his Cradle to Cradle methodology, and experienced my own sustainability epiphany. I have attended all of the TED conferences since for an annual dose of inspiration. This entry was posted on June 30, 2010 at 1:05 pm and is filed under Arts & Culture, Road Trippin' California, Style & Design. You can follow any responses to this entry through the RSS 2.0 feed. You can leave a response, or trackback from your own site.